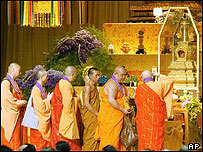 Thousands of people in Hong Kong have flocked to see a rare Buddhist relic on loan from China. A finger bone, purported to be one of the Buddha's, is being exhibited in the territory's Wanchai district to mark the anniversary of the Buddha's birthday on Wednesday. A senior Communist Party official from Beijing presided over the lavish celebrations, saying she was reaching out as a "friend" to all segments of Hong Kong. But critics have dismissed the move as a political gesture to appease the Hong Kong people, many of whom are angry after China refused to let the territory directly elect its next leader in 2007. Buddhist monks in saffron robes blew horns at the ceremonial opening of the exhibition, while thousands of devotees stood and watched. "I am sure all of you will be proud to be Chinese after you see [the finger]," Liu Yandong, director of the Communist Party's United Front Department, told the assembled crowd. "The quick approval of the central government in allowing this exhibition of Buddha's finger bone shows its sincere love for Hong Kong people," Ms Liu told Reuters news agency. The loan of the finger certainly seems to have had a positive impression on some people in Hong Kong. "I would have been delighted just to see a high priest. But to see the Buddha's finger, that is a dream come true," Cheung Yee told Reuters. But others were more sceptical. Lee Cheuk-yan, a pro-democracy lawmaker, said Liu Yandong's presence at the ceremony was nothing more than a "political public relations exercise". The finger was found among a number of other Buddhist relics discovered in an underground shelter at Famen Temple in central China in 1987. It is believed to bring peace and luck.